The Worlds Only waterslide with LED LIGHTS TO SHINE AT NIGHT TIME. Party all Night long with this waterslide unique to CJs. 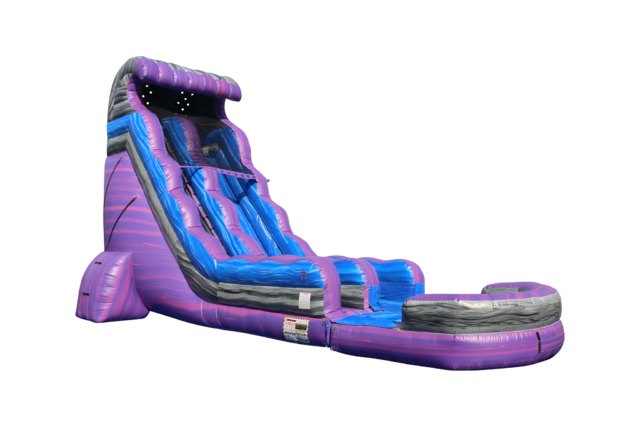 Our 24 ft "Midnight Ride" Inflatable Water Slide is made with a Marble material and it is absolutely breathtaking. The wave at the top makes its design a piece of art itself. THE LED lights are sure to be a hit. Standing at 22ft tall, the " Midnight Ride" Waterslide offers a steep single lane with a large pool at the bottom. As you take the steps up to the top of this above average sized inflatable water slide, you will begin to feel the excitement of what awaits once you reach the top. Once at the top, the view down is jaw dropping. As you sit on the edge, you may feel a little flutter in your stomach….Don’t worry, It is just preparing you for an adrenaline pumped ride down! Ready, Set and Go….You are off!! As you rush down the steep slide lane, you barely have time to hold your nose before making an impressive splash into the large pool waiting at the bottom!! Your guests are going to love this one! !